Some time ago, actually almost two years ago, Rize’s pegs broke. ALL OF THEM. This is a very common issue with Rize. Countless people seem to have experienced the same thing. So a couple months ago, I decided that I might as well get that done. What triggered it was after Elwing’s peg broke. Remember when I posted my January Collection, and it has Elwing in it? Well, the peg was already broken in that picture. She’s also wall leaning. I kinda got fed up with it eventually and went to a hobby store to buy a metal rod. I brought the component parts of Rize and Elwings legs and bases with me so I could find a comparable rod diameter to use. These rods of various gauges are available at pretty much any hobby store or crafts store. (I remember seeing one in Singapore during my outing with the comrades). Of course, I couldn’t find one that was exactly the right fit, but pretty close. It was better to get one that was bigger than the hole, than to get one smaller, so you can get a tight fit. The procedure is actually very simple. It just requires patience, and a steady hand. The tools needed is a simple power drill, or even a hand drill if you feel so inclined. You also need two drill bits, a hacksaw, and some sandpaper. These materials can be purchased at any hardware store for under $15. The rod I got was a 5/32, the drill bits were 1/16 and 9/64. You’ll also need some sort of super glue, which I recommend you get at the hobby store. There are some incredible glues out there, such as Kodomut’s recommendation, Selley’s and other similar products. First thing’s first… turn your power drill to the lowest possible setting. You won’t be drilling it very fast. Practice controlling the speed by pulling on the trigger gently. It is analog after all. The first thing I did was remove the broken peg that was inside of Rize’s hole (sorry, that sounded very sexual). Using the 1/8 drill, I gently and slowly drilled into the peg at an angle (you don’t want to do it straight on 😛 :P). With it being an angle, you will get a lot more grip, making it easier to remove the peg. I gently pulled the peg out. There is a possibility that the peg will simply break and you won’t be able to grip it out. It’s not a loss though. That’s when you use the drill bit to drill around the peg to break it up and just pluck out the bits a little bit at a time. Next, I used the larger drill bit and very lightly cut around the hole to make it bigger, testing it by trying to insert the rod every so often. I didn’t use the power drill for this, and simply held the bit in my hand and spun it around. It’s more controlled and accurate that way. You don’t want to drill the hole deeper anyway. Elwing’s peg was too deep and could not be removed with the same method. So I basically had to drill it out. A nice swirling length of PVC trails come out. The hole looks clean and perfect. Remember not to drill too deep. You don’t need it to go that far. Next, I drilled a hole in the base. Use the power drill for this. Be very slow and careful about this. You don’t want to drill it all the way through to the other side. Pull the drill bit out periodically, clean out everything, and check the depth. How deep it goes isn’t super important. You just need a bit of depth. Elwing’s peg is a little strange. It’s a detachable PVC (weaksauce) peg that gets plugged into both her leg and her base. I don’t know why they didn’t make the peg part of the base; since it’s hard ABS, it would be more durable. I used the 1/8 bit to yank the peg out. The base needed a bit of drilling too. Since it was ABS, manual hand spinning wouldn’t work, so the power drill was used. Again, being careful. Rize’s base now has a nice clean hole in it. To get the proper size of the peg, you need to measure it out. Not an easy task since no ruler would ever fit in there. So what you do is take the 1/8 bit, or a small screwdriver, whatever, and place it in the center of the hole. Hold your fingernail at the top of the hole. You now have your depth of the peg. Don’t let go or move your fingernail yet. Next, insert the rod into the leg, and put the 1/8 bit up against the edge. The spot where your fingernail ends up is where you should make your mark. Another way you can do this is to use your fingernail marking and put it against a ruler. Write down the measurement, and repeat with the leg hole. Add the two numbers together, and you’ve got your peg length. Mark the peg by scratching it either with a pen knife, the drill bit, or other sharp object. Since this is a brass rod, it’s very easy to mark. This is your cut line. Small hacksaws are easy to find at a hardware store and should only cost about $10 at most. They’re only about a mm thick and is ideal for hobby stuff such as this. Place the rod at the edge of the table and carefully start cutting the peg. If you’re afraid of dropping and losing the peg, place a bulldog clip or a large piece of tape at the end of it. After the peg has been cut, sand off the edge of it to make it look nice, if you want to. It’s not necessary, but the cut may be off angle, so you can sand it straight this way too. The grit I used was about 100 grit. If you want a nice smooth finish, you can use a 500 or 1000 grit after that. The glue I chose was this awesome glue called Zap Gel. As you can see, it’s a very small tube, and it cost me $7. But this thing packs a powerful punch. One single dab of this will hold practically ANYTHING together, and will be permanent. You’d sooner break what it’s holding than it breaking the bond. This glue is ideal because not many glues will bond metal. You don’t even have to prep the surface or anything too! As such, it’s a good idea to test your fitting completely before gluing it down. Elwing is fixed. She stands perfect. I decided to place her peg in the base rather than in her leg. She’s actually able to stand without a base! But very dangerous to do so. This is Rize’s completed peg. After placing the peg in, the glue must be allowed to cure and dry. It only takes 15 seconds to bond, and maybe 2 minutes to dry. 24hrs for a full cure. I didn’t want to take any chances and risk having Rize permanently glued to the base, so I let it sit for a good couple of hours. An extra cautionary note on Rize’s peg. Make sure that it’s the full and proper size. If it’s too short, or the hole too big, the peg won’t be able to grip the inside of the hole, and Rize will fall off because of the weight. Rize completed. Notice that the wallpaper is different. I had abandoned this procedure mid-project as other things started to pick up. Apologies on that! Hopefully, this tutorial will inspire you to give it a try, and breathe new life into Rize. If you do attempt this, and need more instructions or help, feel free to leave a comment here, and I will help you as best as I can. Also, if you do successfully fix your Rize, do post pictures and let me know! I build miniatures for wargaming, so I sometimes drill into metal bits, but not with an electric drill, but a hand-held one. I long said I’d do it for Rize, but still haven’t. My thought was to attach a small piece of wood under for me to pin it to, y’know? I need to get to it. That small thing made me so sad I never posted my Rize shots… I also needed to reshoot and it’s a pain with her not standing right. I will fix her though! Some day! I was quite happy with Rize as well. She’s been on display since the first day I got her! Even with her pegs broken, I did not store her away. You can fit the halberd by placing it between the ruffles on her corset. The ruffles will hold it down, keeping the halberd in her palm pretty good. It sounds like you’d be more than ready to attempt this project. I’m not certain what you mean by the wood thing, but if it’s a better solution that what I’ve provided, please do tell me about it! I want to take a flat wooden surface and glue it to the blue rubber-base she comes with, because her base is rubbery and soft, and not really capable of handling weight properly. As for putting her on display, she is on display, at the family cabinet,where she has things to lean on behind her, which would be problematic in my room. And no, the concept of a broken peg and shoddy design and craftmanship will forever annoy me, even if I’ll be able to appreciate her again! Hmmm… the base actually holds up and balances her decently enough, I think. Not sure how aesthetically appealing a secondary wooden base would look. With the metal pegs in place, she stands up perfectly fine. I agree with you on the shoddy design. 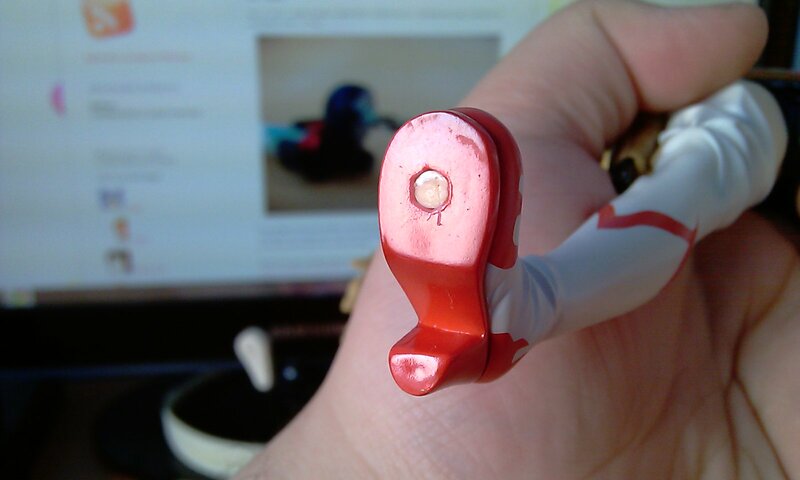 It seems so unlike GoodSmile to let such an oversight through their quality control. I’d have to complain then, about Max Factory Ignis. The lean factor is unacceptable, and could have been so easily avoided. I did not expect a figure of such solid build to be influenced so greatly by the effects of gravity. I guess her breasts are too big? Need to go and find the right drills first. Cool! If you do attempt this, please post pix on your blog! Some nice fixes there, and a metal rod should hold up much better than plastic ones for sure. There are all sorts of brands for glue nowadays, but hearing that this one binds to metal well then I guess there isn’t much to worry about. I guess the most difficult part is to buy the correct tools and actually get to work – I know some collectors are probably too lazy to do it, and it’s understandable to some extent, as DIY sounds like a lot of work and effort to do. Without a bit of passion and determination a repair may deem difficult, as it’s something that’s quite essential for a hobbyist to have. The thing about removing stuck pegs is gonna be potentially useful. Not sure whether there’s a better option for very small parts like figma joints (or more notoriously the wrist joints), but I will look more into it. I totally agree with you there. It’s not so much of a hard task as it is simply being motivated to do it. I suppose it can seem intimidating if it’s not something that you’ve ever done before. The idea that you may end up ruining your figure also doesn’t help either. Hence why I put up this post, to hopefully help people get started, and not worry too much. Figma joints would be a completely different story altogether. It’s way too small. Even a 1/8 drill bit is too big, I believe. I would have no idea where to begin looking for a drill bit that small. My Rize is one of the many that has a broken peg. Luckily she still stands pretty well so there’s no need for me to repair her…YET. But this will definitely come in use when another of Rize’s pegs eventually break (wouldn’t surpise me considering how soft the plastic in her base is, coupled with the weight of her ABS skirt). Knock on wood! Do hope that your Rize will continue to stand. The surprising thing about the pegs, for both Rize and Elwing, was they just kinda gave way. They didn’t fall over or anything. They just sorta… came apart when I was moving them. The pegs used to hold Rize seem like harder plastic than the base itself. You’ll notice that the pegs are actually inserted into the base. Yeah, that was a fun night. I’m not sure what caused it to give way. Could be change in temperature? No clue. Yes, there are definitely some figures where it initially doesn’t fit and you sort of have to “force” their legs into the pegs. And of course, that builds pressure on the pegs as the legs are trying to spread further apart. Sad to hear of your experience. I remember Rize fell over a couple of times while leaning against the wall. It’s a good thing that she’s in a detolf, so her fall was fairly localized. The only pegs I’ve had break on me were those little joints on nendoroids, so I didn’t need to do this much work to fix them. It took me a while though to find a drill bit small enough to pull the broken pieces out. 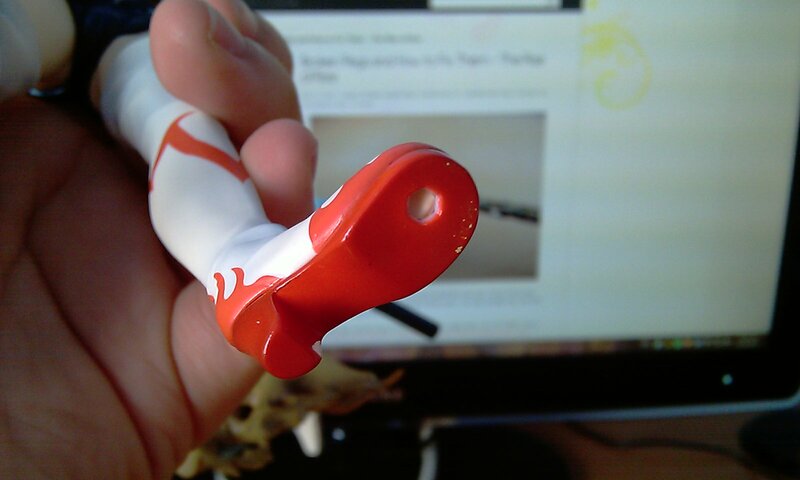 To minimize nendoroid joints breaking, it’s important to move them once in a while. If you have some joints that you know are stubborn, coat the joint with a tiny bit of machine oil/lubricant. Good to hear that you used the drill bit method to pull them out too. I think that it would be more difficult to work on a smaller scale such as figmas. 1:8 are fairly larger, with larger pegs that can afford using standard hardware store tools. I think there is comfort in knowing that when you’re drilling, you’re drilling into a peg, or an already existing hole, so you’re not actually damaging the figure in any way. Sounds like you had a nightmare problem with Miku. Didn’t think that was possible with such high-end figure manufacturers! Are you sure you didn’t get one of those smuggled figmas that didn’t pass quality control? This will prove really useful as i do have a couple of figures similar to this! must have taken a lot of time thought. Hmmm, it took an okay amount of time, I guess… maybe an hour or two in total? I am guessing that the Yuna you’re talking about is from FFX-2, with her holding the dual pistols over her head? Mine leaned too. What I did was heat her legs with a hair dryer on the highest heat setting (don’t worry, the paint won’t melt) until her legs were HOT (lol not sexually). I then carefully bent her legs back (from the ankles, because that’s where the leaning is off) until she looked balanced again. Holding the position, I ran her under cold water for several minutes, cooling the plastic so it’s hard again. She may lean again periodically, but this is a workable solution. I also have one figure with both the pegs broke at the same time and another who doesn’t stand very still even if they’re not broken. But wow, no way i could achieve something like that. I’m the worse do-it-yourself girl in the world ! Sad to hear that one of your figures has a broken peg problem too. While it does seem like an intimidating task to fix something like this, I have to say that it’s actually very easy! I’m not a do-it-yourself person either, and was intimidated by the thought of doing such thing to my figures at first. But when I finally got myself to doing it, I found that it is very easy, and that you have full control over what is going on if you simply try to be careful and mindful of what you do. A very useful tutorial indeed… I might apply this to some of my warped figures in the future. warped figures? what do you mean? No, you’ll most likely break the figure. Figure legs are rarely ever straight like a rod, so chances are you’ll end up drilling through it if you’re not careful. The heat and cool method is best in order to fix leaning figures. I often follow that (hot & cold water) method but it would just go back to its leaning position after a few days or less. Blow drier and cold water perhaps? Yeah, use blow drier and cold water. Hot tap water generally isn’t hot enough. And with a blow drier (especially those that have a narrow opening, or narrow adapter) makes for a more controlled and localized stream of hot air. When you run it under cold water, run it for a LONG time. If it’s not long enough, it will eventually lean back after a while. Also, if the temperature in your house is too high, your figure will eventually lean back, so you do have to periodically re-adjust them. For me, it would be every half a year though. Not every couple of days. NICE! I had been planning on just putting a small screw straight through the base and part way into Rize’s base. But I like this SO MUCH better! Yikes! Drilling a small screw through the base would definitely damage it. The screw would also be sticking out of the bottom, making the base go off balance. This method will definitely require a bit more work, but yeah, the results are much more worth it! Thanks for this tutorial. My Dark Saber figure has a broken peg so this is really useful. 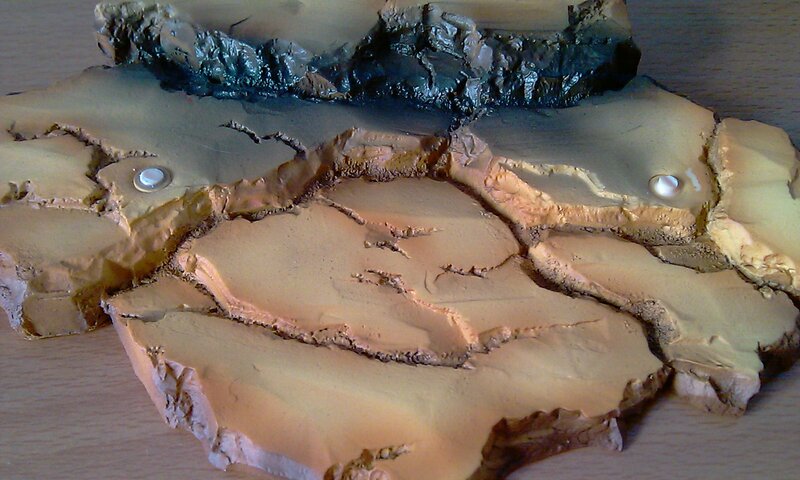 I’m a bit afraid that I’ll crack the base though. If your base is ABS, there is a chance that it would crack. However, if you’re using a drill, and you drill slowly, it will be fine. The drill is essentially “cutting” a hole. As long as you don’t push the drill, your base won’t crack. Don’t get a drill bit that’s too big though. You don’t want to actually drill a hole through the base. You need to make sure your steel peg has something to catch onto under there, and since ABS bases are hollow, this can be a bit challenging. ah im a fairly new collector =3.. i have a dozen figures, but i have yet to open them.. trying to find a nice place to display them and such. 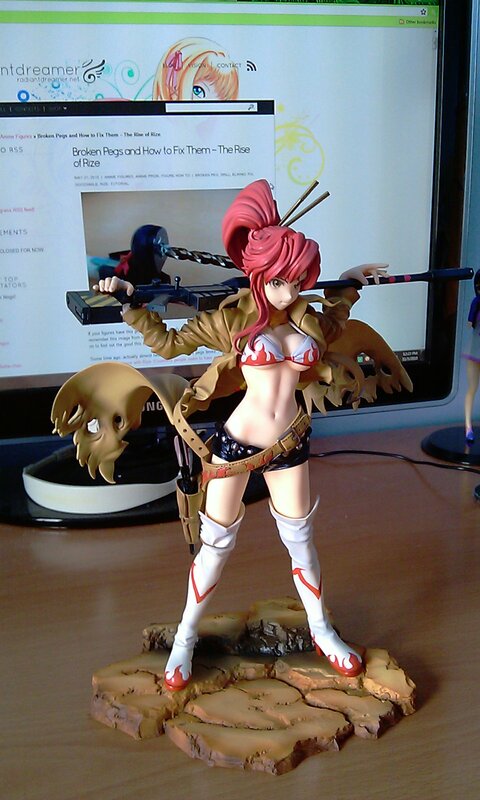 I have this same problem with Yoko Littner by Alter. Yes, Alter @_@ I said it. Anyways, I was thinking of doing the exact same thing you’ve done here BUT slightly different. Do you think it would be a good idea to try and drill into the “part of the peg that is stuck inside” sideways, pull it out then just use gorilla or industrial strength glue to stick the peg back onto the base? Sorry for the bad quality pictures, this is with my cellphone camera. Technically I could leave her as is because of Alter’s amazing sculpting. She stands upright perfectly fine without pegs and also the pegs still “hold” her in position though the pop out EXTREMELY easily since their lengths have been reduced drastically. Thanks for the helpful advice! I don’t know if I’ll get any notifications or anything from this post but I’ll check back here soon XD Thanks again! Drilling into the peg sideways to pull it out was the exact method I used. You just need a small enough drill bit. It will work, but the peg gets relatively damaged in the process. You can definitely try gluing the broken peg back on, but it’s really a band-aid solution, and probably won’t hold out very well before snapping off again. Even though she stands fine with little support from the pegs, it’s a bit dangerous, since it pops off easily. Rize was leaned against the display case for a long time, and she kept falling over every so often. Do keep checking back on my blog, as I post helpful tips on figure stuff periodically. Cheers! okay so im only twelve, but im a big time anime collecter. I have quite a few problems with some of my Miku nendroids. Miku HMO edition lost a pigtail. The peg snapped and part of it is still in her head. I am afraid if i try to remove it, it will damage the figure. On my snow miku, the peg that connects her torso and hips have snapped. I cannot remove the peg. I’ve tried many different ways, but have just made it harder to remove the peg from the hole. snow miku’s base peg also wont fit into her back. the hole for the base peg became deformed in shipping proscess. You seem to know what you are doing with this. Can you give me any advice? If you use the methods I have outlined, it should be easy to remove the pegs. You just have to be very very careful. If you’re only 12 then I’m assuming you have very little experience (if any) with power tools. I’d suggest you get help from someone who does have experience (and probably even owns what you need). I’ve heard that the snow miku hip peg is easy to snap because of how poorly designed it was. The only thing you can do is glue it. As for the support peg, I doubt that it’s from shipping. But, you can make the hole bigger by drilling, and it should fit then. No one has commented on this in a long while, but here’s hoping I get a response. I had the peg snap off on a figure with a really thin base that is clear plastic. Any tips on trying to replace the peg in that situation? Hi Betty! Thanks for commenting! This seems like a very tough scenario here… clear bases are difficult to hide cosmetic changes, even if it’s underneath the base. It being thin makes it even more challenging! If you are fond of the base, and don’t mind some cosmetic imperfections, you can “thicken” the underside of the base so that a peg will have something to catch. This is provided that the base itself is raised. If it’s a flush base, the only option you have is to attach an additional base underneath it. My suggestion would be an old CD or two that you don’t need any more. You use your base to trace the shape on the cds, and very very carefully cut the CDs. Then drill a hole into the cds for pegs. This would be incredibly difficult, because CDs can crack very easily! My honest recommendation would be to discard the base, and just buy a new one. They can be easily found on eBay, e2046.com and local hobby shops for under $10!